Working with an asset manager should be as trustful as a good marriage. At any rate, the business model and personal ambitions of BLUE Asset Management are meant to perpetuate long-term relationships. rutan gladly accepted the invitation and completed the redesign of not only a new CI and a more modern and lighter logo, but invested a lot of high spirits into BLUE Asset’s new web site. After the relaunch, the internet presence now presents itself from a brand new perspective. The new web site on its homepage consciously goes without image and graphics contents to not distract from BLUE Asset’s inner values. Instead the page sparks the viewer with serene color gradients and weightless elegance. Playfully corresponding to the old English wedding rhyme „Something old, something new, something borrowed, something blue…“, the homepage is now structured into four areas. „Something old” presents the existing facts and reached output in press releases or investment examples. “Something new” accordingly focuses on future developments with investment criteria, strategies and goals. Customer relations are strongly based on the individual at BLUE Asset. “Something borrowed”, therefore, deals with the search for the maybe most valuable capital: responsible and incorruptible professionals for blue asset’s growing work force. The color blue in BLUE Asset Management is a symbol for fidelity, reliance and reliability. 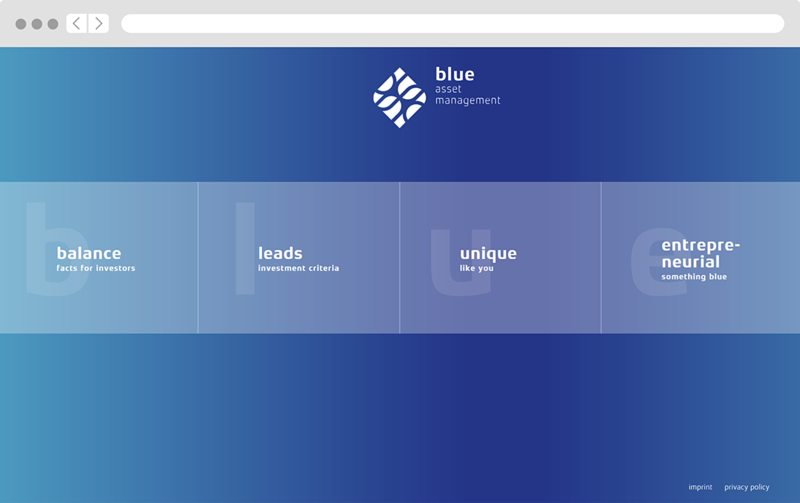 “Something blue” introduces the team and network of BLUE Asset and communicates the company’s philosophy. rutan completed the makeover with matching presentation templates, stationary and business cards, as well as a corporate presentation. Thus equipped, BLUE Asset certainly is a good catch. Our name is programme! So, please dont print this Web page, and do something good for the environment.